Levanto is a larger and more exciting town than the Cinque Terre villages and is a better base for travelers. You can easily drive in and out of Levanto and you are connected to the Cinque Terre villages by train. You can also get to many other Ligurian towns by train. In Levanto there are more than fifteen high quality restaurants and many shops. Our piazza has a weekly open air market attended by people from far and near. The population of Levanto is about 5,000. As there are only a few hundred rooms available to tourists, Levanto never loses its charm and intimacy, no matter when you choose to visit. Levanto offers castles, public gardens, and incredible architecture. Historic churches ring their bells to signal the time of day. There are many outdoor activities available: tennis, scuba diving, surfing, bike rentals, paddle boats. Levanto has sandy beaches and a swimming pool (that overlooks the Mediterranean for sun worshipers). You can go walking or hiking into our magnificent mountains right from the town. Levanto is the next town north of the Cinque Terre and is the doorway to the region. The landscape here is so special that in 1998 the area was listed as a world heritage site under the protection of Unesco. A nature park and a marine park have been created to preserve the environment. The villages are small and old and are perched on the edge of steep hills that run down to the sea. All, except Corniglia, are close to the sea. Corniglia sits on a cliff maybe a thousand feet above the sea. Until the 1960's, these villages were not accessible by road. Try the famous white wine of the Cinque Terre as well as the "Sciacchetra" (a dessert wine). 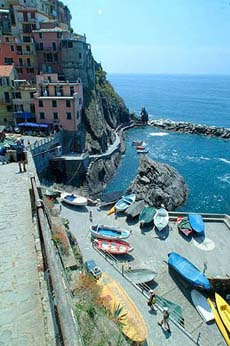 In August 2001, the National Park of the Cinque Terre started some new initiatives for tourists. One such initiative is that a ticket is now needed in order to walk on the "Via Dell'amore" – the first part of the Cinque Terre trail. Tickets are also needed for the electric buses which connect the parking lots to the centre of the villages and the Center of Naturalistic Observations of Guardiola Tower. The funds gathered from these tickets help with the maintenance of the Cinque Terre trail and park. 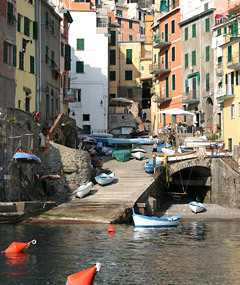 The Cinque Terre Card is one ticket you can purchase to simplify your visit to the Cinque Terre. When you purchase the Cinque Terre Card you get: unlimited travel in second class on the trains between Levanto and La Spezia, access to all the services of the National Park of the Cinque Terre, hiking on the "Via Dell'Amore" and the path for Guardiola tower.